Compaclite Adventure is a sleek and modern luggage set of three suitcases of 20, 24 or 28 inches size, made of ABS + PC material, with the nice color options of nickel, olive, and silver. 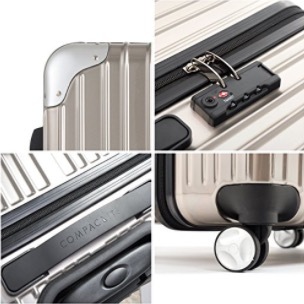 These are the spinner type suitcases with 8 multi-directional spinner wheels on each and they’re all lightweight despite being built sturdy and durable with fine metallic finishes. The total shipping weight for three suitcases is 23 pounds and the largest one weighs 8 pounds. This is an imported product but being US stock, so it should be shipped pretty quickly with each luggage put inside each other. And you can certainly store them this way- small into the medium size and medium into the largest 28-inch suitcase, especially if you don’t have a lot of space in your room.The 20-inch carry-on luggage size meets the cabin luggage requirements of most major US airline companies. They have the thin layer of detachable protection film on the outside that you need to peel off but is nice to have to be protected during shipping and handling. And there is the fabric lining inside with a divider/organizer and tie-down straps to better organize your clothes and other stuff. These are not expandable type suitcases but are nicely compartmentalized.ABS+PC combination is what makes this luggage set lightweight and sturdy and durable. Due to lightweight, it is nice to be able to put more into your suitcases without going over the luggage weight restrictions. Even the smallest 20-inch cabin luggage has the 4 x dual spinner wheels that roll smoothly in multiple directions, making it easier to maneuver in tight areas. With the easily adjustable telescoping handles you can move them around easily, no matter how tall or short you are. And you have the side carry handles on each one of them to give you a bit of flexibility in which way you hold your suitcases. The corner protection armors will help the suitcases avoid damage from impact and will help it last longer. All the three suitcases include the TSA-approved combo code locks for security and to prevent airport luggage staff not getting into your luggage. These are strong, reliable and durable suitcases, as the exterior surface is ABS and PC (polycarbonate) combination, include aluminum trolley and corner armors. Compaclite Adventure seems like a very well-made luggage set that should last many years of frequent traveling unless treated badly or thrown around by airline staff. The price is quite reasonable considering the low weight, user friendliness, functionality, and durability. Silver, olive, and nickel colors are quite nice and not too flashy, but smooth and shiny enough once you remove the protective film. This set is offered with a three-year limited warranty for the defects from manufacturing but does not cover the usual wear and tear or the damage caused by airlines.